Magnum has unveiled two new flavours to refresh us this summer: the playful Magnum Pink, which is a raspberry ice cream with sauce coated in chocolate with a pearlescent pink finish which is super refreshing, tangy as raspberry should be and makes our lips go silvery (a little bit!). And the sophisticated Magnum Black, a coffee sauce swirled through smooth vanilla ice cream and coated in dark chocolate. The coffee is dominant but not overpowering, the dark chocolate coating adds to the sweet bitterness. Yes, double yum. 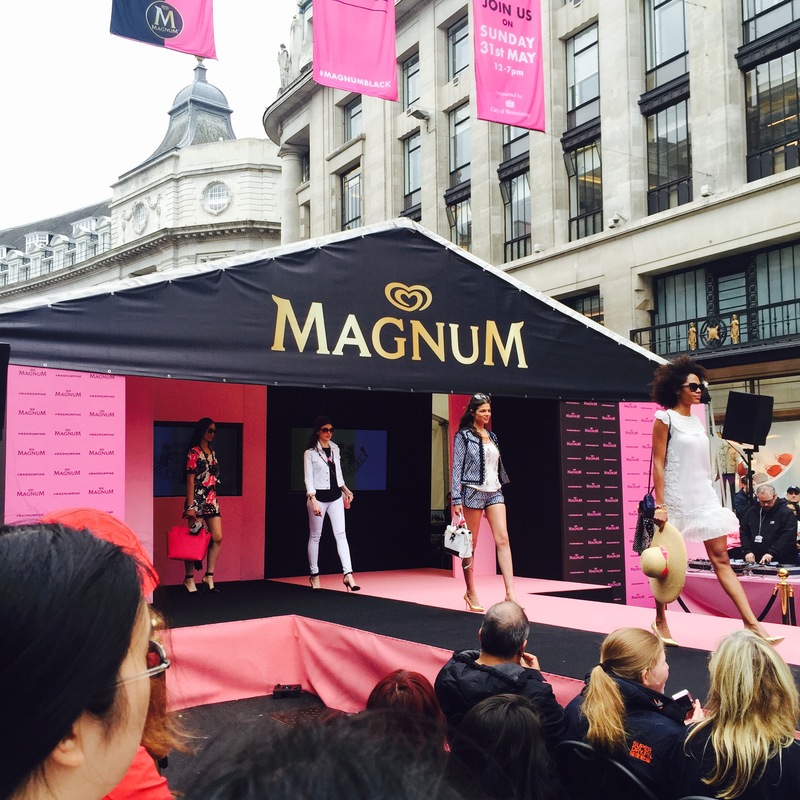 Regent Street was closed for traffic for the event – there were benches running down the middle, a fashion show from Regent Street reatailers happening every so often, live music, performances and performers, shopping discounts, prizes and giveaways. 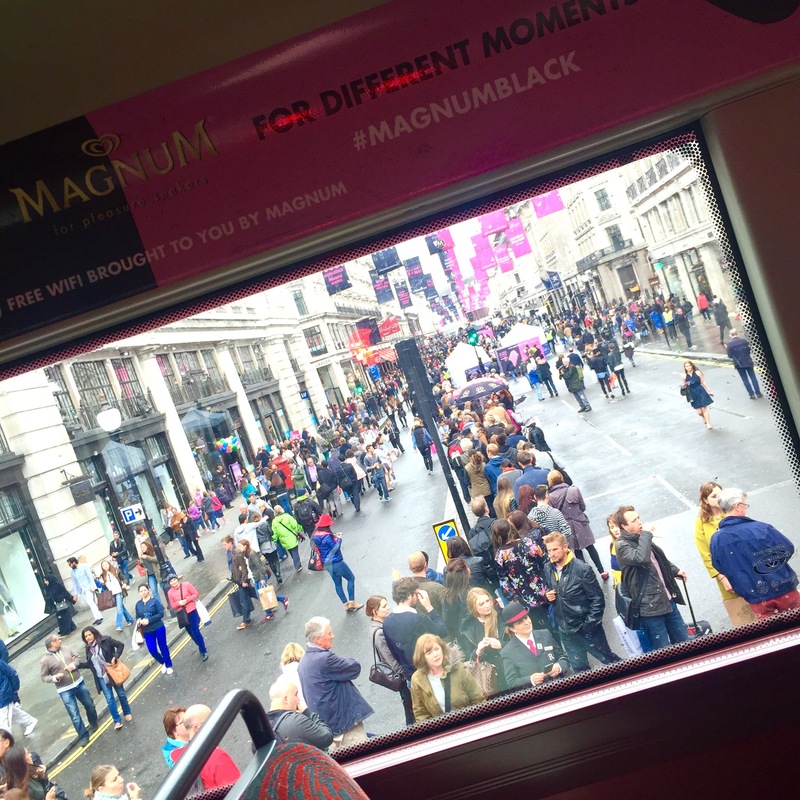 Overall a lot of family fun and a fabulous buzz in the Magnum street party. The Magnum Emporium was designed by the beautiful (like, truly stunning) and ever so lovely Mollie King, from The Saturdays. The immersive experience showed her stylish interpretation of the playful and sophisticated worlds of the new pink and black flavours. Pink was a dreamy cherry blossom garden with swings and a GIANT SNOWGLOBE (yes, I’m shouting) you could get into. No joke. Black was a cool art-deco inspired jazz club, with live music and some mementos of a bygone glamorous era. Finally, let’s head to my favourite place in the event: the VIP Magnum (PINK!) bus. With the free-flowing pink bubbly (and pink lemonade) in hands we were whisked to the dipping bar and had the first look at the Emporium. We also had the chance to meet Mollie in the bus, which also had hand massages, an outside garden seating area and overall, just a fabulous party vibe. I was lucky enough to be invited as a blogger but the social team behind Magnum was also sending invitations to members of the public which were at the event and posting. What a fabulous way to spend the afternoon. Oh, and did I mention pretty much endless ice cream being handed over to the public? Yeah, that. 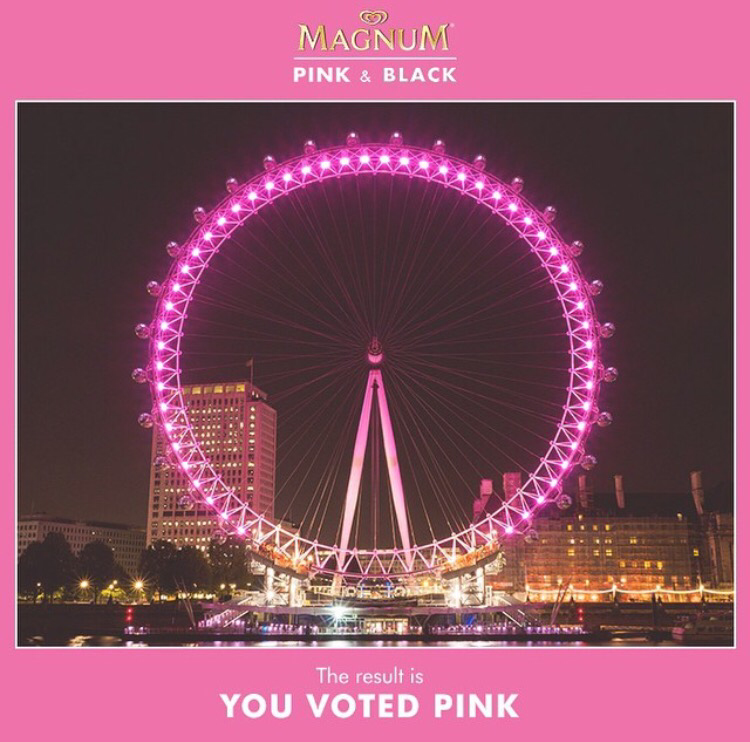 As if all this wasn’t enough, the grand finale was the London Eye being lit up on the ice cream colour chosen by the public’s use of the hashtags #MagnumPink and #MagnumBlack. Pink won and the heart of London was tickled pink. How pretty is that? 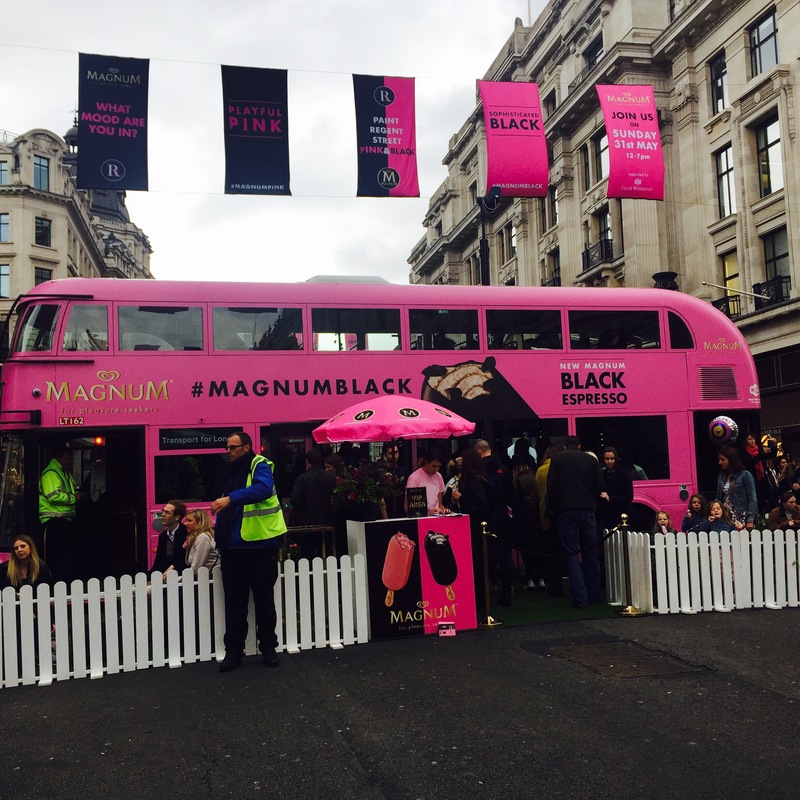 If you missed the party, do not despair – you can buy Magnum Pink and Magnum Black ice cream in many retailers around the country. If in doubt about which new flavour to try (as they are both fabulous), they even come in a mixed little bites box! With many thanks to Magnum UK and the fabulous folk (like, really freaking amazing) at Golin. You guys rock. Big time. Reblogged this on Cat Eyes Red Lips. can you send that swing set to my apartment? the event looked great. It was a lovely way to spend a Sunday afternoon! It was a lot of fun! A great Sunday afternoon. Indeed it was, although it was raining in the beginning, it turned out to be decent weather.